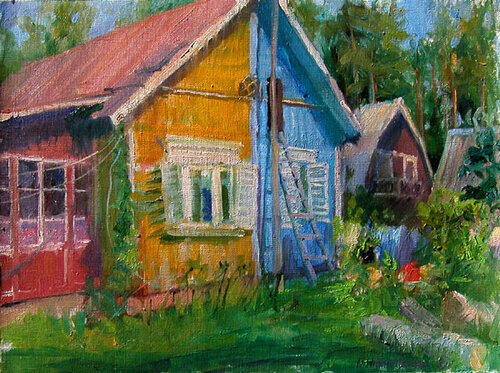 Dacha. Dacha is a term that refers to a summerhouse and can stand for pretty much everything from a small wooden shack without running water, gas or electricity to a lavish multi-story house in the countryside. While not everyone has a dacha, most people have relatives, neighbours or friends who do, and everyone who can normally jump at the opportunity to leave the city on weekends and escape to cleaner air and nature. Dachas are usually big projects that require the involvement of the entire family. Most dachas are not used in winter, but as soon as the last snow has gone people set out to repair and prepare their dachas for the coming summer. The majority of people who have even a small plot of land still plant vegetables and herbs at their dacha and many also have apple trees and berries. These of course require constant maintenance all the way to late autumn when the plots and trees have to be prepared for the coming winter. In short, a dacha is often not a place to relax and lie in the sun but rather a second full-time job. 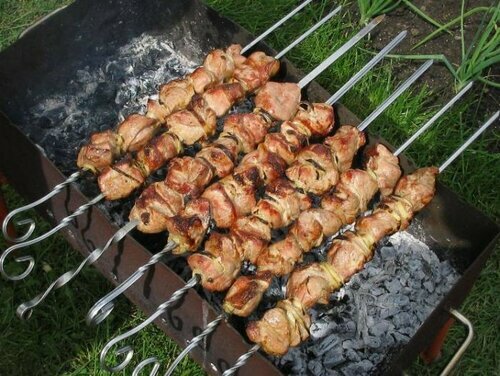 Shashlyki (barbecues) are a very popular activity on summer weekends when Russians often invite friends to their dacha for a barbecue. Over the centuries, the Russian banya (bath house) has served people not only as a place where they could clean themselves, but also as a place for restoring health. It is believed that by visiting the banya many health problems can be cured. 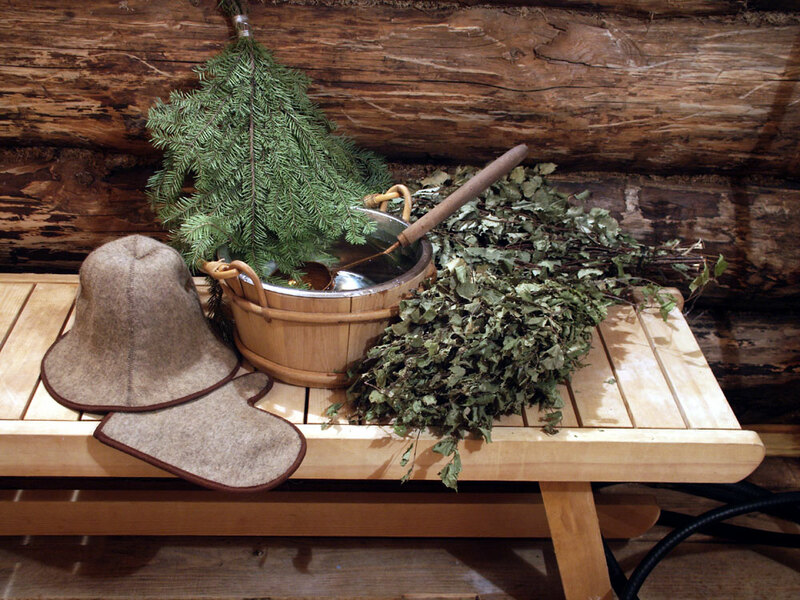 Among other positive effects, the steam in the banya helps expel fat from the body, restores the tonus of blood vessels and clean pores.The difference between the Russian banya and the Finnish sauna lies in the kind of steam. The steam in the Russian banya is humid, and in order to reach the best effect, hot water is poured onto hot stones. The temperature inside a Russian banya can reach 60°C (140°F). The steam in a Finnish sauna, on the other hand, is dry, and the temperature can reach up to 100°C (212°F). After having spent some time in the steam room, banya visitors will jump into a pool with gold water as a kind of contrast treatment. A very important banya attribute is the "venik" (a kind of broom made from dried birch, oak or fir branches and leaves), which banya visitors beach each other with. Apart from a positive effect on health, the banya also is a place where friends get together to relax. While at the banya, Russians like to drink beer, which is often accompanied by "vobla" - a kind of dried fish. Sometimes people have too much fun at the banya - a great example of this is provided in the very funny and highly recommended Soviet comedy "The Irony of Fate". It is a tradition dating back to ancient times. Russia has a lot of forest areas where different kinds of mushrooms grow in abundance. While mushrooms have always been an important component of the national diet, they have also become a substitute for meat during the Orthodox Christian Lent. Over 200 kinds of edible mushrooms grow in Russia. Apart from protein and fats, mushrooms also contain a number of minerals such as iron, calcium, and zinc. However, there are also about 25 poisonous types of mushrooms in Russia, so unless you are very experienced you should never collect and consume mushrooms without consulting with an expert in this field. You can tell that mushroom season has arrived when you see them being sold outside metro stations. While you should never collect and consume mushrooms that grow in Moscow or within a 30 km radius of the city, the Moscow region is considered relatively safe. A mushroom collecting trip usually involves a long car or train ride to ecologically clean area outside Moscow. If you want to get there before others do, you have to leave home in the wee hours of morning. Remember that forest areas are very popular with mosquitoes so make sure you bring sufficient amounts of mosquito repellent and wear long-sleeved shirts. The most common kind of edible mushrooms are chanterelle, oyster mushrooms, porcini and yellow boletus. A mushroom-hunting trip is often an excuse for a fun trip to the country, and if you fail to find any you can always quietly buy some from sellers at the roadside, and claim you found them yourself. Be ready to cook them into dishes or freeze them when you get home - they won't keep more than a day without spoiling. The same trip can also be a good chance to pick some forest wild berries - blackberries, redcurrants, and many others flourish within just an hour of the city limits. It is a very popular winter activity that often the whole family participates in. Children learn this sport at school from an early age. You can engage in cross-country skiing in any of Moscow's larger parks. While you will see people fishing in the Moskva River, fishing is not recommended in Moscow due to highly polluted rivers and ponds. You can however go fishing at any of the larger water reservoirs river parts outside of town. Grandchildren are a very popular activity for any grandmother (and grandfather). It is very common in Russia for grandparents to take care of their grandchildren while their parents are at work. They will take the children for walks, take them to the playground, to/from kindergarten or school, will cook them lunch, and often even supervise their homework assignments. Many grandchildren spend the entire summer at their grandparents' dacha, giving the parents some time for themselves. While this may seem very convenient, it sometimes results in problems as parents and grandparents often have very different ideas on how to best raise a child. Russians traditionally lived in extended families in one big house until very recently, and many of the grandparents involved will have been raised in that way. It is a less common, but nevertheless very interesting pastime. An extreme way of keeping fit, the ice swimmers (called "morzhi" - walruses in Russian) are very proud of their "sport" and consider it a way of life. Even babies and toddlers are subjected to short immersion in ice cold water to make them strong, and may people in their 70s and 80s still regularly engage in this invigorating activity on a regular basis. The roots of ice swimming date back to pre-revolutionary times and have links to the Russian Orthodox Church as a way of cleaning sin. Every winter during religious festivals, worshippers would submerge themselves in icy waters to erase all sins from their bodies. For contemporary "morzhi", however, ice swimming is part of everyday life rather than a religious practice. When ice forms on lakes and rivers, these enthusiastic sportsmen will cut swimming holes in the ice that are carefully maintained so that bathing is possible throughout the winter. Each session is very short but a challenging experience for the uninitiated. If you want to try ice swimming, please consult with your doctor before jumping into the icy water. While this is a stimulating and energizing activity, it can easily send your body into spasms and causes severe joint ache. Based on the materials from the book "Living in Moscow" by Barbara Spier.